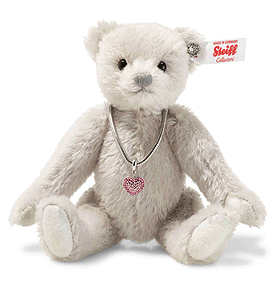 Love Teddy Bear by Steiff. A beautiful limited edition Steiff item, hand made in lilac and grey mohair. Product details: fully jointed, safety eyes, synthetic filling material, non growler. Size 18cm standing & 13cm Sitting. Comes boxed, together with a numbered certificate of authenticity. Crystals from Swarovski® Swarovski® is a registered trademark of Swarovski AG. An invitation to fall in love – number two. Made of finest mohair in a delicate shade of lilac, the smaller Love Teddy bear fits perfectly with his larger counterpart, right down to his crystal “Button in Ear”. Placed close to your jewellery box, the pink Swarovski crystals on his heart-shaped pendant are a joy to behold every day. The chain is a striking bracelet to which further pendants can be added at will. Helping to make your bear truly one of a kind!